There’s an FMCG brand that uses AI when working with Mediacom, explained Renee Mellow, head of emerging digital activation, EMEA. They were looking at food trends about what’s important and convenient. But they were using AI that looked through imagery of millions of influencers across social media. "The product team started developing product based on data. AI from the marketing team comes really up funnel into product development, it’s driving sales and making us more relevant as a brand – that is huge for a marketing team, to be operationally integrated at that level. And AI is at the core." 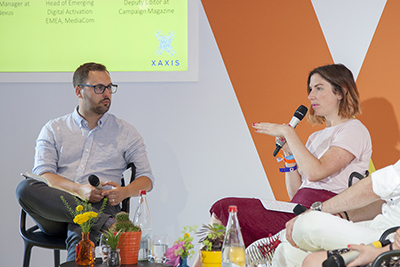 Mellow was talking on a Xaxis-hosted panel discussion at the Cannes Lions 2018 festival that interrogated AI in practice. What difference is it really making to business outcomes? How is it having such an impact? But first, Campaign contributing editor Alex Brownsell asked the panellists what AI isn’t – what are the common misconceptions? Mellow said that it shouldn’t be intimidating and it’s not exclusively technical. You don’t have to have 18 PHDs on your team to use AI: "The truth is that marketers are in such a great position to take on some of this work. We are very customer centric, we understand target audiences, we have a great sense of user flow and how to speak to customers regularly. It doesn’t need to be intimidating." Gabczewski..."We must be open to failure, be transparent, be repeatable in terms of sharing data." 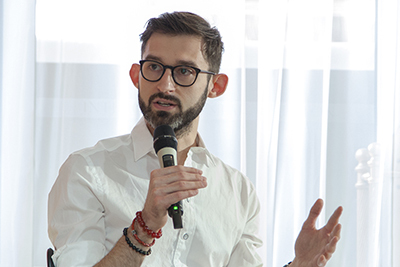 Jake Grabczewski, director of product management, Xaxis said that the industry confuses AI with machine learning exclusively, which means there’s a danger of not realising its full potential. There’s a myth "that it consists of one specific thing. But it’s more an umbrella term". 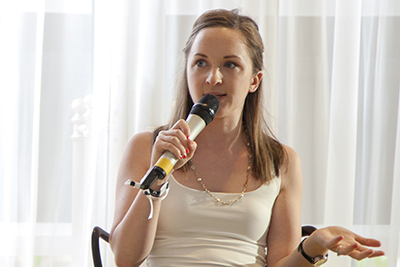 The demise of human importance is another myth, said Anne Coghlan, AI product manager, at Appnexus. This simply isn’t true because "as a marketer, you may need a ‘translator’, but you can have huge value". 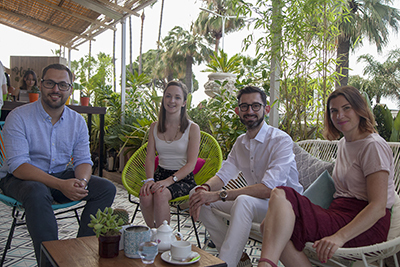 And it’s that surprising, creative use of AI, Coghlan explained, where the power lies – it’s not just about iterated buying: "Wayfarer were able to provide, using AI, a really tailored creative strategy. They were able to take tons of data points and think about the value of the impression but also what message to show the user. They were able to deliver highly personalised effective ads that you just wouldn’t be able to do at the scale they could." And yes AI is all about efficiencies, said Grabczewski, but that doesn’t mean it’s going for cheap: "We’ve developed algorithms that will pay 10 to 100 times what humans will be willing to pay. Because by using AI, we can be more aggressive, pay premiums and get more effectiveness overall from the budget." A UK-based insurance provider, partnered with Xaxis to drive online sales for car breakdown coverage programmatically. Their secondary goal of 40% IAS viewability made this optimisation more complex. Xaxis’s Copilot Helios bids according to performance. It finds pockets of performance to optimise towards and adjust bids based on the two goals. Quickly, the RAC shifted 100% of prospecting budget to Copilot Helios: the manually-optimised CPA dropped by a third and viewability jumped 11%. In fact viewability surpassed the client’s goal. But the pure-play creative use is Mellow's focus, because the delivery and optimisation usage AI is almost a given now. What can it actually do? She described a travel client: "They have the easiest job in terms of creative. Destinations are beautiful, the places people want to go are easy to shoot. So our clients had heaps and heaps of assets and when they started managing that content, they used AI in a specific way, to find out what content resonates. The AI is the spine for them. The content goes in all different platforms – the first expression has been in a chatbot – but that investment in AI based on content can go anywhere. It is understanding that it’s a core component of their tech stack." Mellow..."You start to play, then you get a bit of scale and then the creativity will come out." This is an example of Mellow’s AI marketing future – where automation is a given, we expect prediction, prediction is even commoditised – but now the fun begins: "Then we can create something with imagination – we can develop different use cases. And that’s the best side of marketing: creativity. That’s what gets you out of bed and that’s what wins awards." But Grabczewski argued that there’s plenty of creativity within optimisation, you just don’t necessarily label it as such. AI improves experiences: "Subtle things are becoming possible because of a bunch of different technologies that are at the heart of AI." Grabczewski said another shift in AI usage is taking data that’s offline, using those inputs online… and joining the chain: "Agencies have built models for clients where the sale doesn’t happen online. Now we’re taking those outputs and building them directly into outcomes our technologies are optimising against. So there’s a data-science model on both sides." A global auto brand have a unique formula for measuring the efficiency and effectiveness of their media through conversion events that happen across mobile and desktop devices. The company is working with Xaxis to optimise their bidding strategies against these measures. Xaxis created a custom metric that uses log data to score impressions according to the client's effectiveness and efficiency formulas. These impression scores pass to Google who optimise their bidding strategies on the back of this insight. Effectiveness improved by 7% and efficiency 57%. Other metrics also improved hugely with clicks nearly doubling and conversions improving by just under 70%. He said that AI is making a difference in scale and complexity: "We can get all the data to speak the same language. In the past you’d be losing that consistency of conversation." And it’s this data conversation that AI is smoothing out. Coghlan said: "Marketers do not know what to do with their data. AI is a natural evolution in the process of finding out what they can actually do with the data." Brands can see AI as a dangerous and large investment. But it needn’t be that way. Mellow explained: "There’s an interesting backlash where you see brands dip their toe in and they are trying a tactical use of AI in some way. Then you hear people say ‘it’s so short term, what a waste of money’. You can upskill marketing teams by dipping their toes in the water and not having to make a huge investment. You have to start getting ahead and learning how to use it. I love us trying and learning and I hate when we, as an industry, say it’s too tactical, it’s not meaningful enough. It’s great! Go for it!" Coghlan..."As a marketer, you may need a ‘translator’, but you can have huge value"
Mellow described AT&T’s AI strategy. "Access is key for companies. Get the tools and let your team play. AT&T have done this, they have a contract with an AI supplier and it’s on the desktop of every single person’s laptop. You start to play, then you get a bit of scale and then the creativity will come out. People will get their hands dirty, will find out what’s relevant and what they want to tackle." Coghlan says the barriers – the fear – manifests itself in different ways: "That example of AI bidding higher than a human would ever do… What we sometimes do with an AI output is impinge our human thoughts onto this machine-learned result. AI doesn’t see patterns in the way we do, it doesn’t have our bias. This means it may bid on a particularly day 20 times higher than a human, but it can explain why. People feel AI is systemic and important – but they fear they won’t be able to explain the results." Grabczewski said: "It is important to keep people in the loop and build technology that works in concert with the things that people really love. The technology does not think outside its data environment. Underpinning all this, to make really practical, outcome-driven use of AI is an openness of data, said Grabczewski. "We’ll all be successful when there’s a solution that is the best that fits and it actually talks to all parts of the chain. We must be open to failure, be transparent, be repeatable in terms of sharing data. To be effective, we really have to embrace those scientific principles in the industry and not be shy of being wrong – share the data to understand how to improve." A Danish electronics company aimed to target views programmatically in the areas around their bricks-and-mortar locations to drive sales. An analysis of store revenue had showed potential to improve CPA through targeting users near high revenue stores. Using a mapping of postal codes to store revenue and labels of ‘high’, ‘medium’ and ‘low’ , Xaxis’ machine-learning algorithms learned from data to predict conversions more quickly and bid more efficiently than using impression data alone. Over a two month period, CPA across all four conversion events improved over 23% compared with the control.